Back in high school my class was learning about fermentation. We broke into small groups and followed a recipe to make homemade root beer. We bottled our brew and then waited. Weeks went by and then it happened. The corks on our bottles started to pop with the force of bullets. Something was obviously wrong with our recipe. While someone could have been seriously hurt by flying shrapnel, our lab experiment doesn’t compare to a recent incident at the University of Bristol, located in the United Kingdom. According to an article in The Guardian, a building was evacuated after a student accidentally made the same explosive that was used in the Paris terror attacks. The university said triacetone triperoxide (TATP) was “unintentionally formed” in its chemistry laboratory. “The student was following a published literature method and the risk of TATP as a potential byproduct had been identified during the risk assessment process,” the article notes. A university spokesperson said the chemistry department’s risk-assessment process was being reviewed to determine whether additional checks could be made. When is the last time your facility’s risk-assessment process was reviewed? 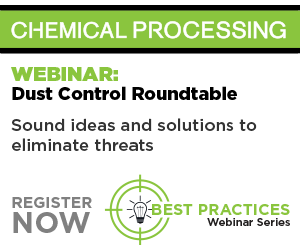 If you want to buff up on your process safety standards, I suggest you join me as I moderate our Process Safety webinar series for Chemical Processing. The first installment of the series is today (Feb. 16) at 2 p.m. ET. The topic is leadership. Our series speaker is Dr. M. Sam Mannan, director of the Mary Kay O'Connor Process Safety Center at Texas A&M. His no-holds-barred approach is a must-hear for anyone charged with keeping workers and operations safe. Be sure to watch Dr. Mannan’s message on the importance of this series. Traci Purdum is Chemical Processing’s senior digital editor and webinar moderator. She’s been known to fill dead air with corny knock-knock jokes. You can email her joke submissions at tpurdum@putman.net.